For the benefit of readers who do not have or cannot afford a subscription to The Irish Times, here is that journal’s latest report on Friends of Sinn Fein’s fund raising in North America. No great surprises here except that in the period reported, between May and October 2017, FoSF gave circa $3,500.00 to American politicians. 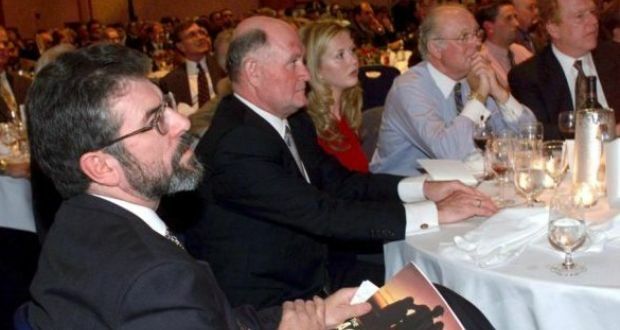 Sinn Fein joins the donor class? The greatest single item of non-office expenditure was on travel – $29k – which included three trips to the US by Gerry Adams and one by his heir apparent Mary Lou McDonald and Martin McGuinness’ replacement in the North, Michelle O’Neill. The usual clutch of Irish-American construction businesses, some owned by exiles from Tyrone, were the largest donors. These included Fay Devlin, the founder of EuroTech. Fay Devlin? Now there’s a name to conjure with. Friends of Sinn Féin, the party’s US-based fundraising arm, raised more than $102,000 (€86,000) from donors in the six months to the end of the October, new filings show. The figures, disclosed in financial returns submitted to the US Department of Justice, show that the New York-based group spent $117,000 during the period between May 1st, 2017 and October 31st, 2017. No money was spent on behalf of Sinn Féin in Northern Ireland during the six months, unlike the previous six-month period when almost $20,000 went on election-related expenses in March. The bulk of the expenditure in the latest reporting period went on administration expenses ($34,825), payroll and payroll taxes ($30,400), and travel-related expenses ($29,000). Most of the 38 donations came from companies involved in the construction industry in New York, some of which are owned by Irish-Americans and Irish emigrants. There were also donations from several trade unions representing the building sector. The donors included wealthy Tyrone-born businessman Patrick Donaghy who gave the group two separate donations of $5,000. Structure Tone, the New York construction company he co-founded in the early 1970s, also donated $5,000. Mr Donaghy and Structure Tone, one of the biggest construction companies on the US east coast, have been long-time donors to the party’s US division in the 22 years that it has been fundraising through Friends of Sinn Féin in the United States. The vast majority of the most recently reported donations came from companies based in New York, though money also came from New Jersey, Wisconsin, Florida and California. In the filing, the group also lists political donations made by its Kentucky-based treasurer Mark Guilfoyle. who assumed the role this year. He gave a total of $3,400 to politicians in his home state and neighbouring Ohio, including $500 to the Democratic mayor of Cincinnati John Cranley who was re-elected last month. Other recipients were Gary Moore ($500), an elected judge, and Louis Kelly ($100), a state attorney, both in Boone County, Kentucky; Kris Knochelmann ($500), an elected judge in Kenton County, Kentucky; and Amy Murray ($500), a independent member of Cincinnati City Council. The group also donated $800 to the Democratic Judicial Fund in Hamilton County, Ohio. The latest filings contain detailed schedules of three trips taken by Sinn Féin President Gerry Adams to the US. He travelled to the US twice in July and again in November to attend the annual Friends of Sinn Féin dinner in New York, the organisation’s busiest fundraising event. The total money raised at this year’s dinner falls outside the reporting period of the latest filing. In July, he met former US envoy for Northern Ireland Dr Richard Haass and Irish-American trade union leader Terry O’Sullivan, another major donor to the US group, in New York. Mr Adams returned later that month to attend a memorial mass for the late Martin McGuinness, the former Sinn Féin deputy First Minister of Northern Ireland, in Washington. Mr Adams was accompanied on the November trip to New York by Sinn Féin’s deputy leader Mary Lou McDonald and Michelle O’Neill, the party’s leader at the Northern Ireland Assembly. The three participated in a conference call at the Manhattan offices of Eurotech Construction, the company founded by another long-time donor to the party, Tyrone native Fay Devlin. The next day Mr Adams met Bernadette Kelly, the international representative of the Teamsters trade union. Unlike in the Republic of Ireland, there are no restrictions on political parties in Northern Ireland receiving election donations from foreign countries. Overseas political parties are obliged under the US Foreign Agents Registration Act to make returns showing their fundraising and other activities.